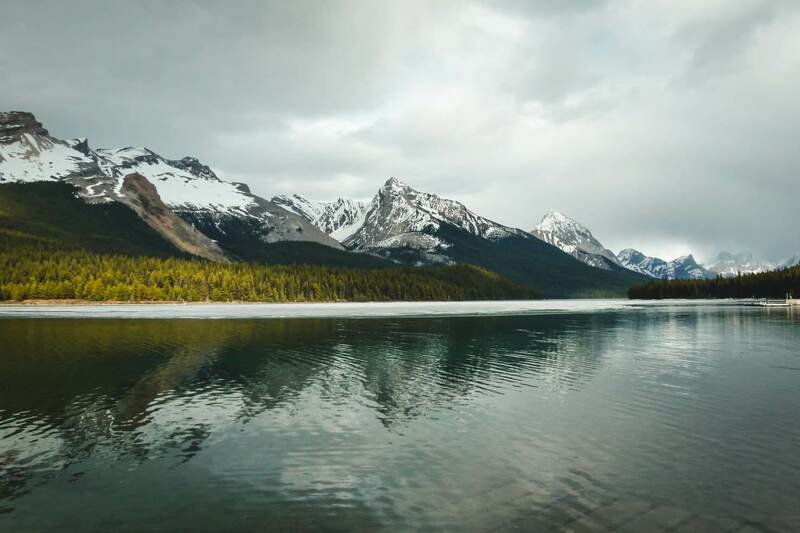 With plenty of hikes to suit every level, mesmerizing lakes, glaciers, waterfalls, and wildlife, hiking in Jasper is always inspiring. 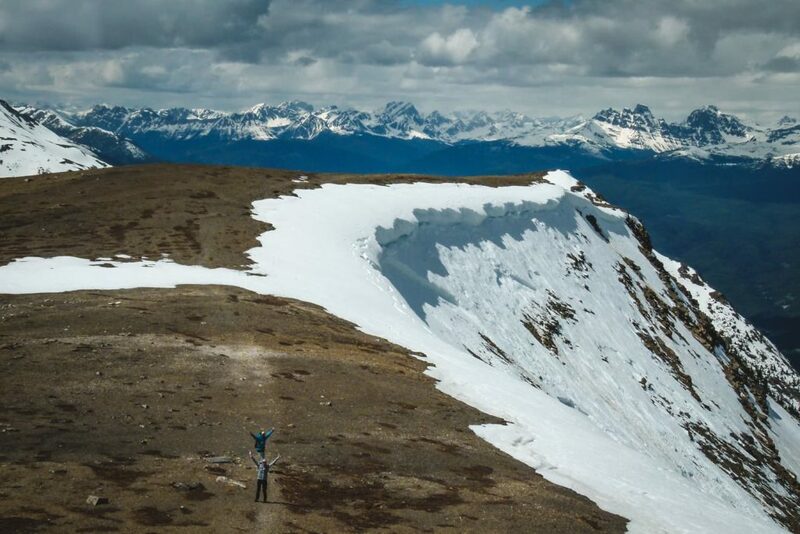 Our list of best hikes in Jasper is growing every year as we’re coming back for more. 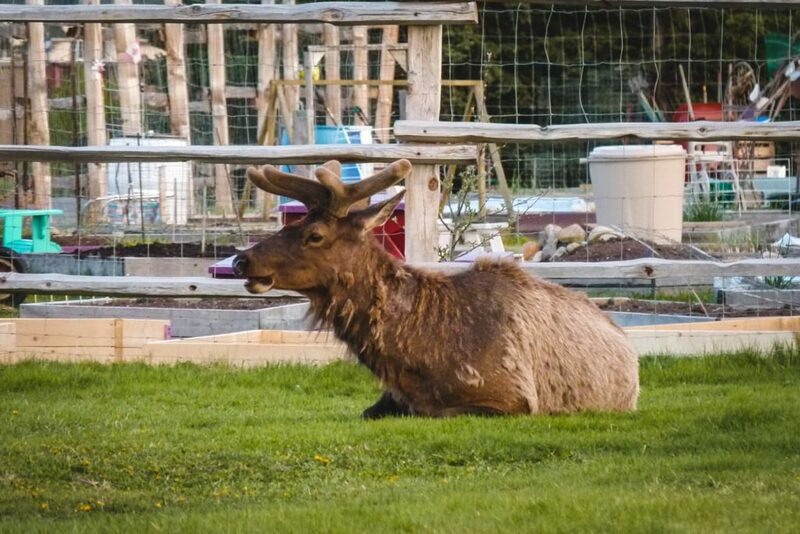 After living in Banff National Park for a little while, we got more curious about what its neighbours have to offer. Waiting for the snow to melt after winter, which turned out to be a long lasting situation, we couldn’t be more excited about our new spring adventures. We decided to try hiking in Jasper National Park, the largest national park in the Canadian Rockies. If you’re driving from Calgary, the mountains starting to surround you just shortly after leaving the city and you don’t know where to look or stop first. Driving from Banff to Jasper on the Icefields Parkway, roughly 290 km, can be stretched to more than a few hours. 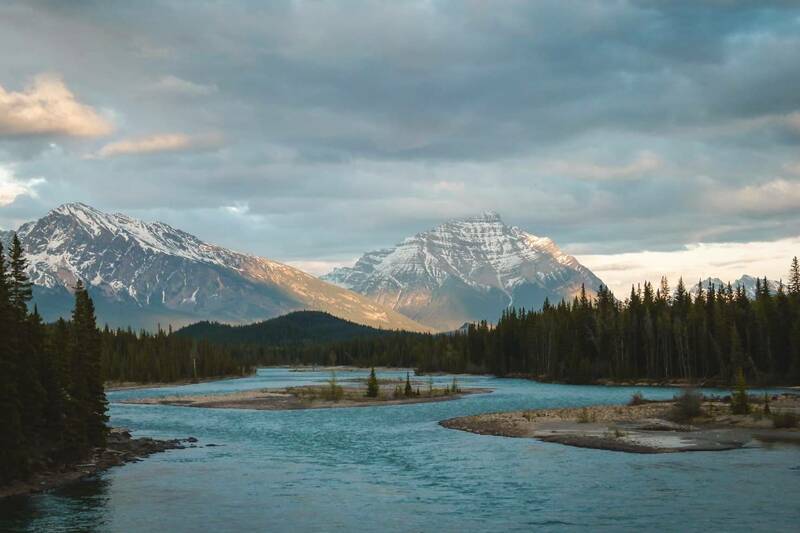 Snow covered high peaks of the Canadian Rockies, wildlife searching for some food along the highway or signs that invite you to explore lakes and waterfalls. 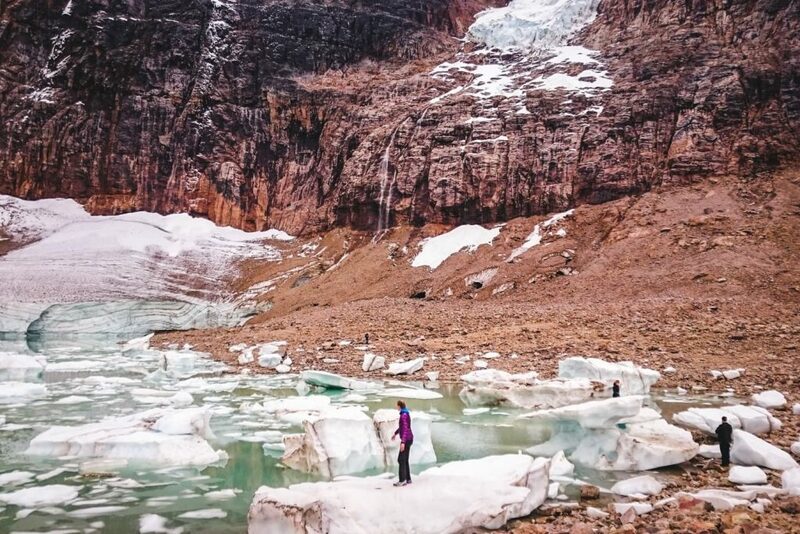 Take time and explore the gems along the Icefields Parkway that the Rockies are famous for. Since our first visit to Jasper, we keep coming back. 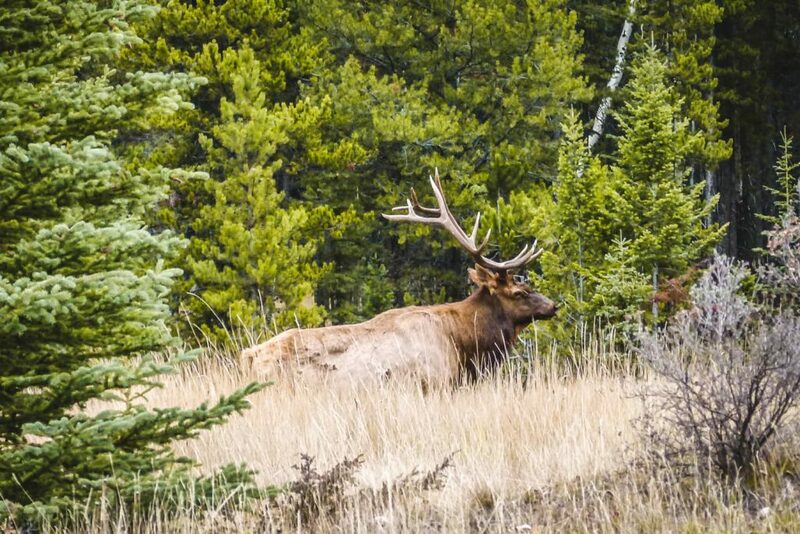 It is our favourite national park of all in the Canadian Rockies. Since it’s so big, people are spread out through the valley and unlike the neighbouring Banff, it never felt crowded. The first time we’ve visited in May when usually spring is in full swing. In the Rockies though, this is just the beginning of spring and mountain peaks (and sometimes valleys) are still covered by snow. Many of the lakes in Jasper were still frozen. 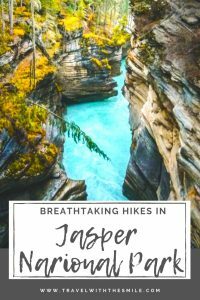 Most of these Jasper hikes are located south from Jasper, with a few north from Jasper. 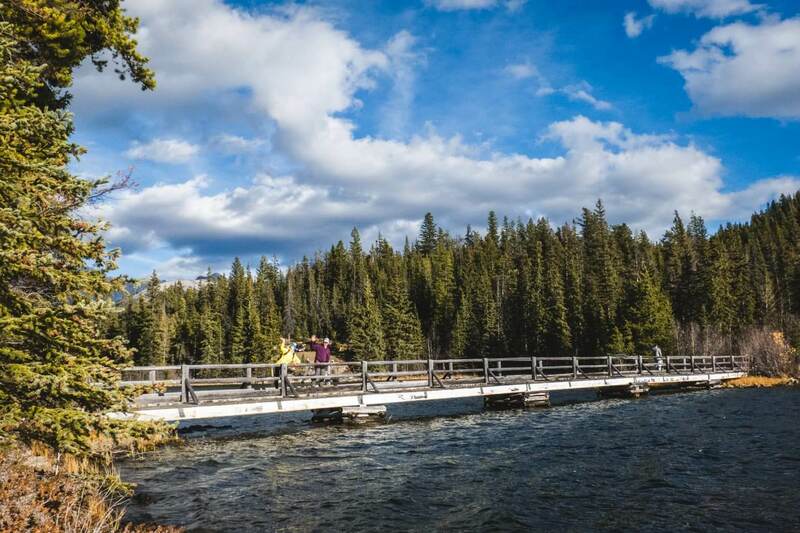 Take full advantage of the short hiking season in the Canadian Rockies and explore these hiking trails in Jasper National Park. I’ve listed a lot of hikes to choose from based on your fitness level and time available. Enjoy! The below Jasper hikes are listed based on the distance from the Jasper town to the trailhead, from closest to the furthest. One of the many lakes near Jasper’s townsite is Pyramid Lake. It’s the biggest one which can be accessed from town without a car. 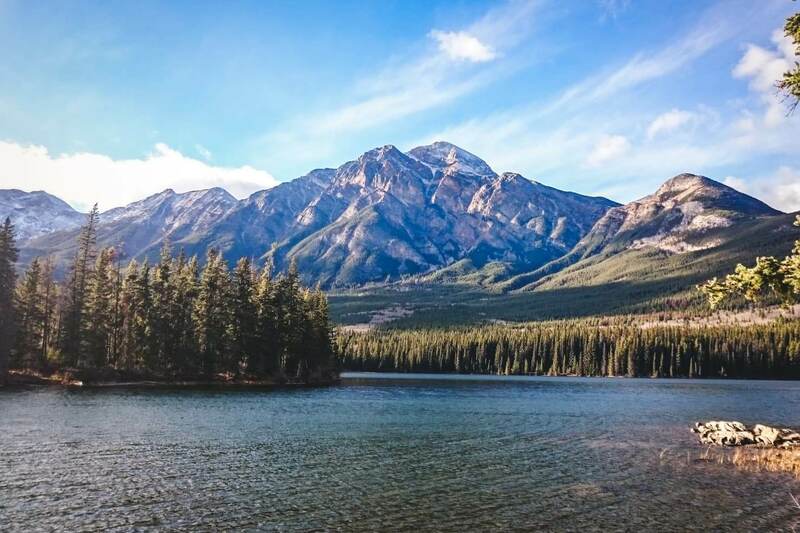 With its neighbour Patricia Lake, they lie at the foot of Pyramid Mountain, a landmark that overlooks the town of Jasper. Take an easy stroll around the lakes, watch for wildlife or million stars at night. Jasper is officially Dark Sky Preserve, an area where almost no artificial lighting is visible at night. It’s celebrated during the Jasper Dark Sky Festival in October, on the Pyramid Island. Most enjoyable activity for us was mountain biking around Pyramid Lake and other lakes, stopping for a quick cool off in the lake and having a picnic on the Pyramid Island. For the Pyramid Lake viewpoint, start hiking at the parking lot for Jasper Activity Centre. Afterward, you can rent a canoe or kayak and paddle across the lake. Winter offers snowshoeing & cross country skiing trails and sleigh rides. The most popular hike in Jasper National Park is climbing up the Whistlers Peak. 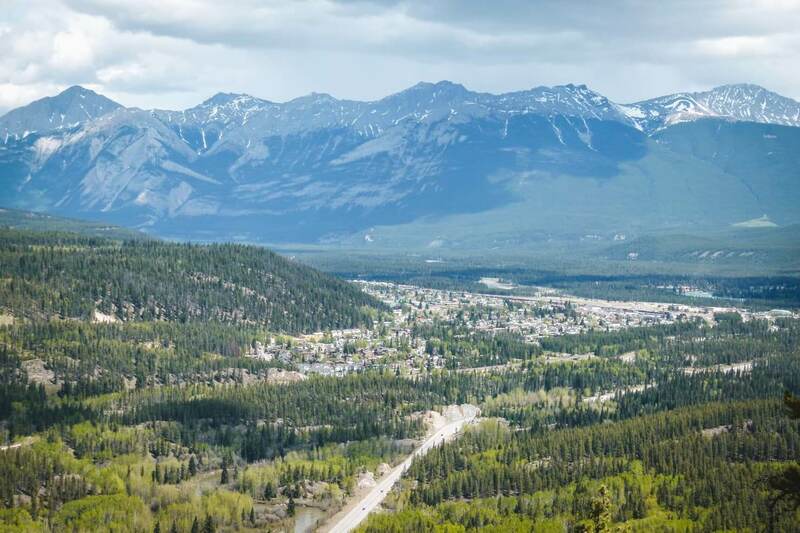 The trail to the top and the Sky Tram is located just 6 km from Jasper. When you go from Jasper, take Highway 93 (Icefields Parkway) south for 2 km, turn right on the Whistler’s Road 3km until you reach the parking lot. You can hike the steep trail in full length of 9 km with a gain elevation of 1200 m and pass through all three of the park’s life zones. The trail starts near the west end of the parking lot. The switchbacks are gradually going up until the steepest section just before you reach the Whistlers summit. Once you hike above the tramway terminal, you will have a 360° panoramic view. 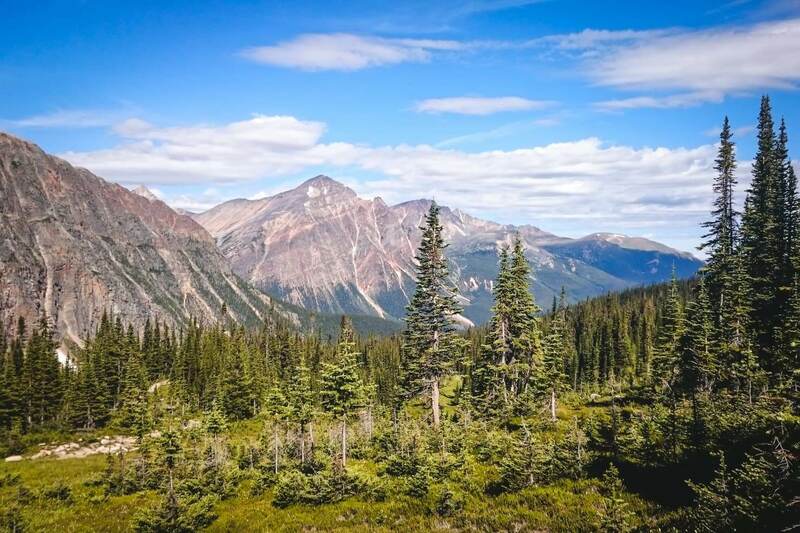 Hiking up the Whistlers Mountain wasn’t an option for us because of the avalanche danger in May and we can’t wait to go back to Jasper and hike up the Whistlers Mountain, it sounds like a great challenge. 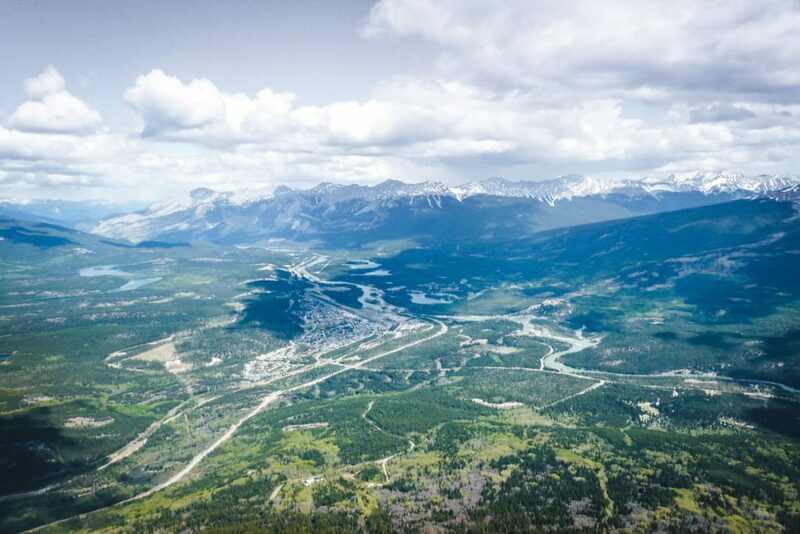 Top of the mountain rises to 2,470 m above sea level and offers panoramic views of the Jasper National Park. Peak finder on top will help you name surrounding peaks, including Mount Robson, the highest peak of the Canadian Rockies at 3,954 m.
If you continue past the Whistlers Peak and leave the crowds behind, you will be rewarded by the endless mountain views and solitude. The trail is a scramble in parts as you hike on loose rocks and should be attempted by only by experienced hikers. With a beautiful Pyramid Mountain behind you, you will see Mount Robson in front of you rising high above all other peaks. If you decide to pay the steep price for the Sky Tram, make it worth it and explore the mountain ridge as much as you can beyond the Whistlers Peak. The shorter trail is a loop around the Lake Annette. The longer one is called Bighorn Alley, a hiking/biking trail leading from Jasper to the lakes. Lake Edith and neighbouring Lake Annette are both located about 9 km from Jasper. The blue-green coloured lakes can be enjoyed from the canoe, kayak or stand up paddle board which you can rent on the sandy beach. These two lakes are shallow and quite warm, considering the usual ice cold water in big lakes, so you can enjoy a swim. There are also plenty of BBQ grills and picnic tables in the area. 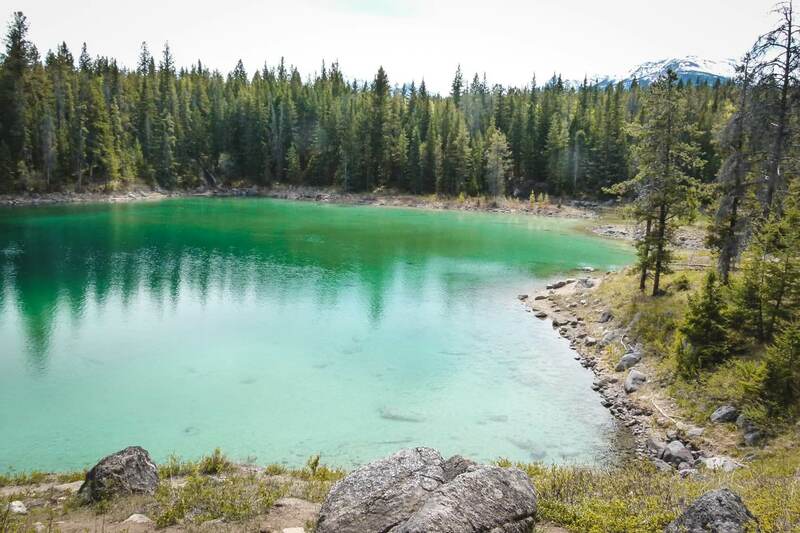 One of the most popular hikes due to its proximity to Jasper, easy trails and astonishing lakes is located 10 km south of Jasper. 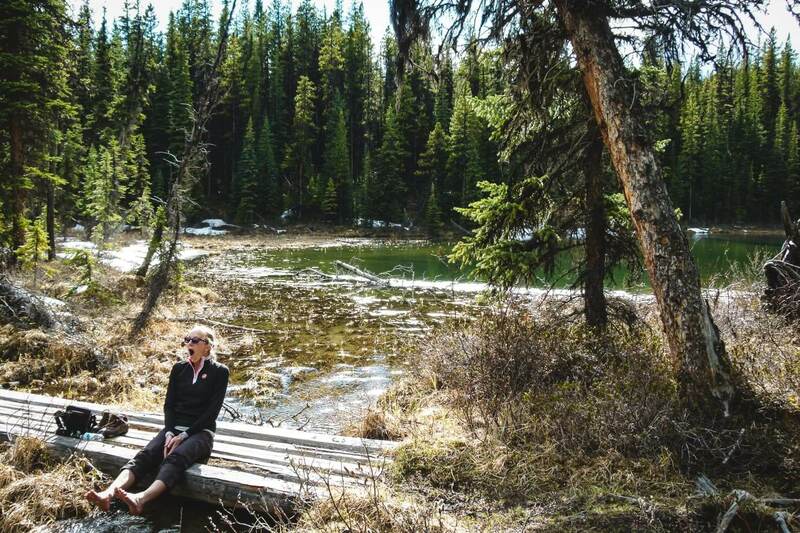 It’s also one of our favourite easy hikes in Jasper. The trailhead begins just off the Icefields Parkway. Hiking along the five lakes can take anywhere from 1-3 hours. We were so amazed by the shades of jade and blue, that we had to stop very often to enjoy it to the fullest. So every time you pass another lake from a different side, notice the change of the colour. The hike starts with a walk through the forest, crossing the bridge over the Wabasso Creek. Soon after there is a junction for starting the circuit. Whichever path you choose, make sure to visit ALL five lakes. You will be astonished. 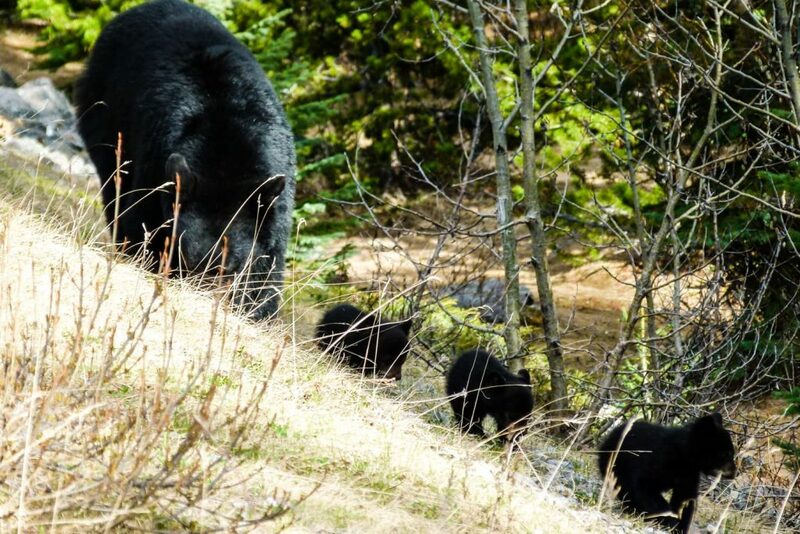 As we visited in spring, where not only nature but wildlife comes to life, we were lucky to see many mountain goats and bears with cubs. Truly an unforgettable experience! 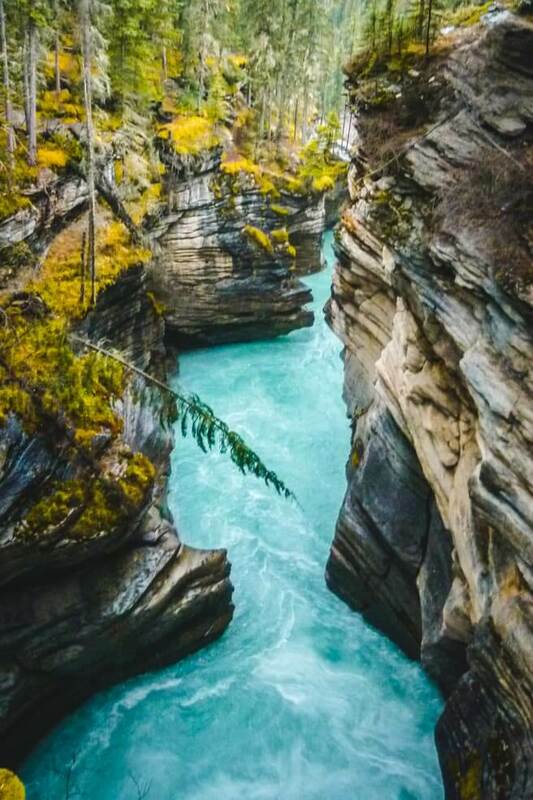 Maligne Canyon is one of the most interesting canyons in the Canadian Rockies. It is fed by Maligne River from the Maligne Lake. There are six bridges built to help explore this magnificent canyon. Many trails are found along the way, starting near each of the bridge. I would recommend hiking through all six bridges and enjoy spectacular and changing views. The trail is only 11 km north from Jasper. 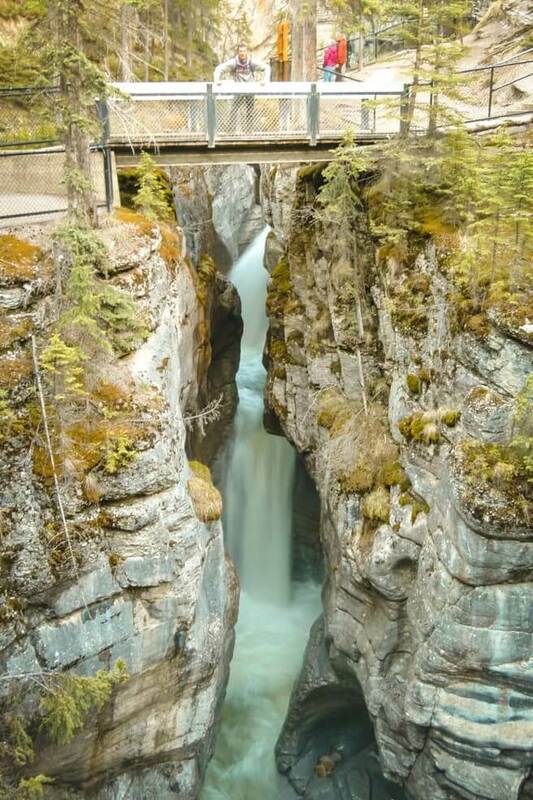 To get to the Maligne Canyon trailhead, follow Highway 16 to Edmonton. Go 2, 5 km past the Jasper exit and follow signs to Maligne Canyon. A very popular hike where you can easily hike up close to the glacier. It is in a very fragile area – the road leading to the trail opens mid-June and Parks Canada required to purchase a permit to access it. Thanks to the improvements they made, there will be no permit required in summer 2019. Yay! It’s around 25 km south of Jasper. 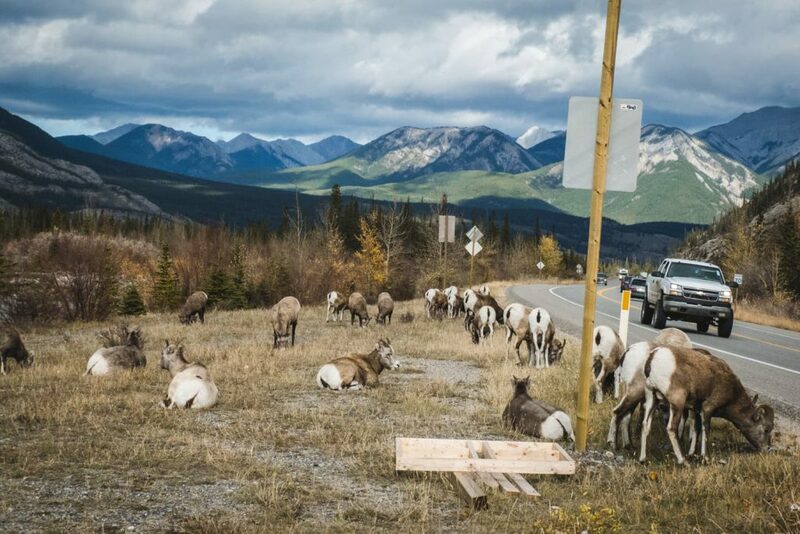 Driving south from Jasper on Icefields Parkway, once you pass the Wapiti Campground on the left, you will take the next right to 93A. 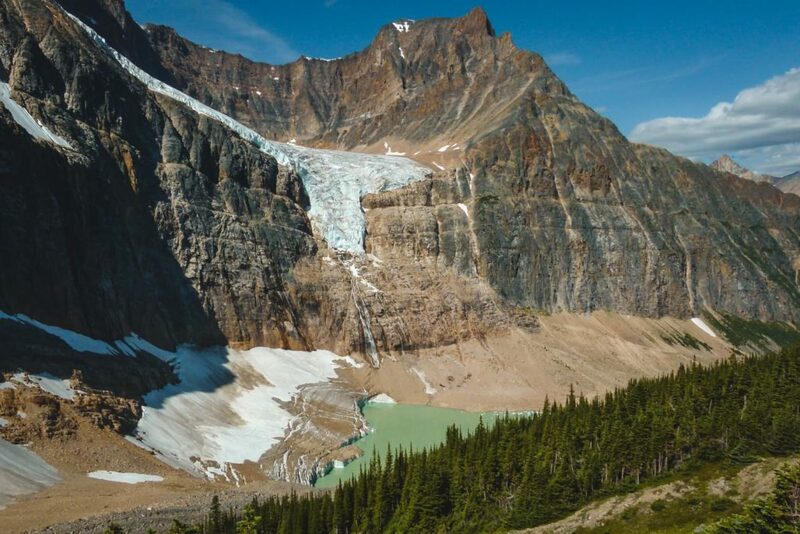 Then take the 2nd right to Mount Edith Cavell Road and up the switchbacks, there is a big parking lot at the end of the road and also public toilets. 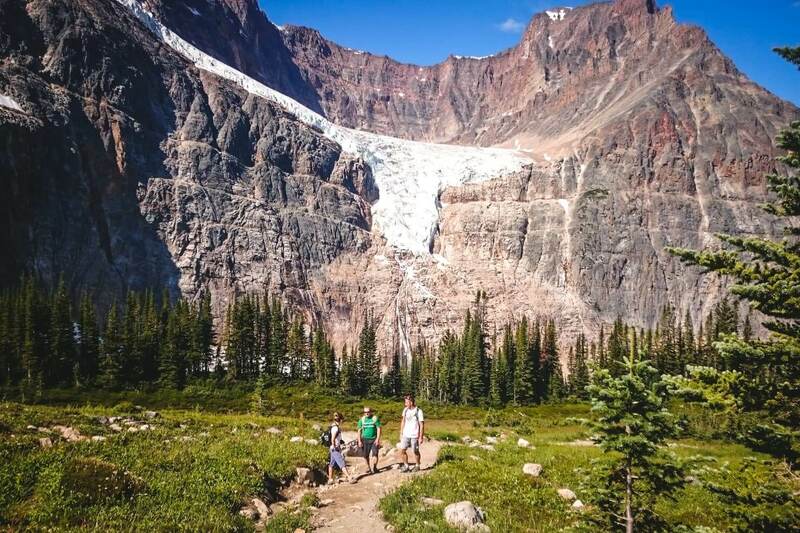 The Cavell Meadows trail to see the Angel Glacier is the easiest part. Then hike the hill that’s directly behind you to get the best views from the top. The steep trail up the scree is less frequented but the views are well worth the effort. We both loved this hike. 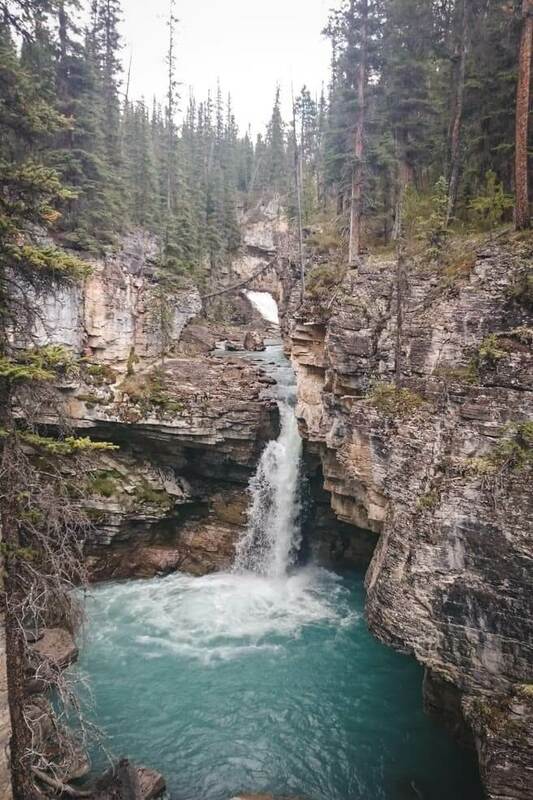 If you only have time for one hike in Jasper, make it this one. 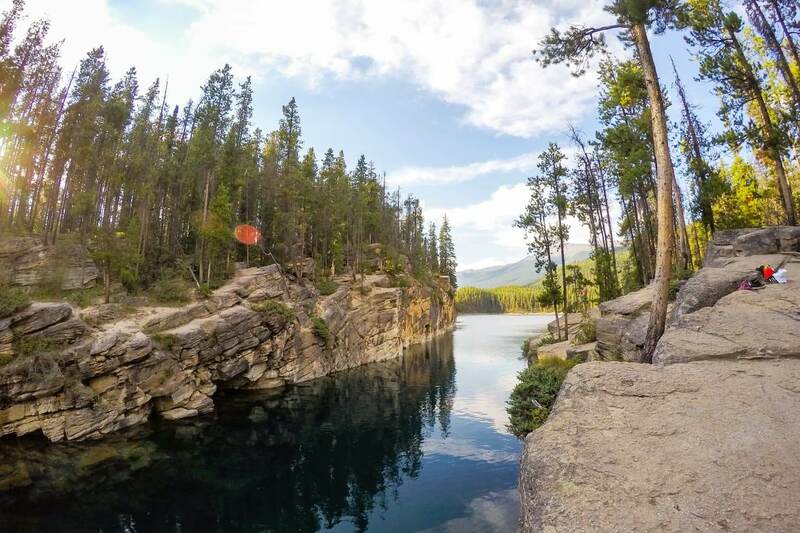 Visiting Horseshoe Lake is not so much about hiking as it is about cliff diving. 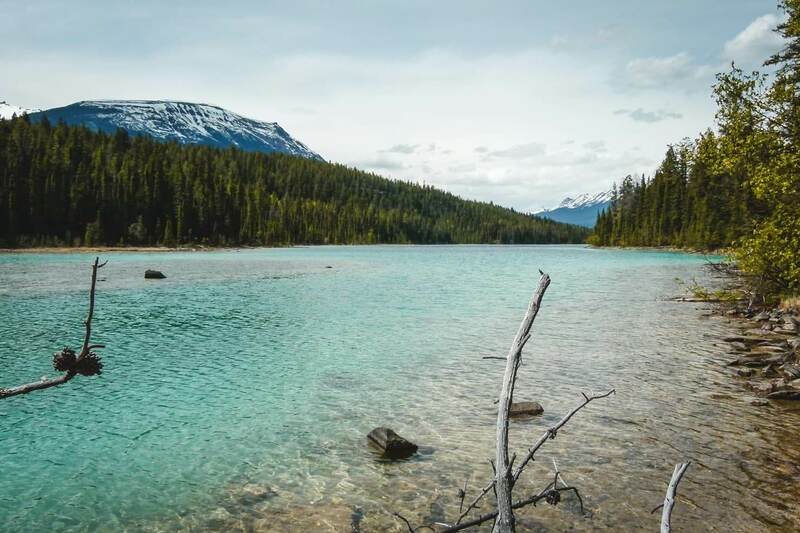 The lake is 28 km south from Jasper on Icefields Parkway and after a short through the forest; you will have the option to hike around it. We didn’t even hike around because we came for the cliff diving. Since the rock walls around the lake have different heights, it’s easy to choose from 1 to 20 meters. The crystal clear water and amazing green colour of the lake are very inviting. The water is incredibly cold even during summer but the adrenaline from cliff jumping is contagious. Just a word of caution: If you haven’t cliff dived before, make sure you work your way up from the smallest cliff to the bigger ones. One guy injured his back when we visited because he jumped from one of the highest cliffs with no previous experience and his friends had to call an ambulance. It’s not a dangerous activity as long as you gain experience before trying to show off to your friends. TIP: If you are not a fan of ice cold water, no worries. 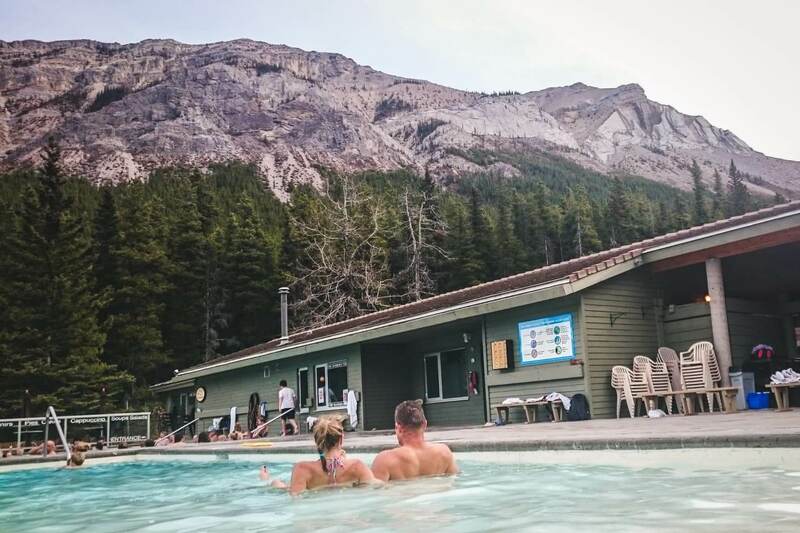 Visit Miette hot springs near Jasper. 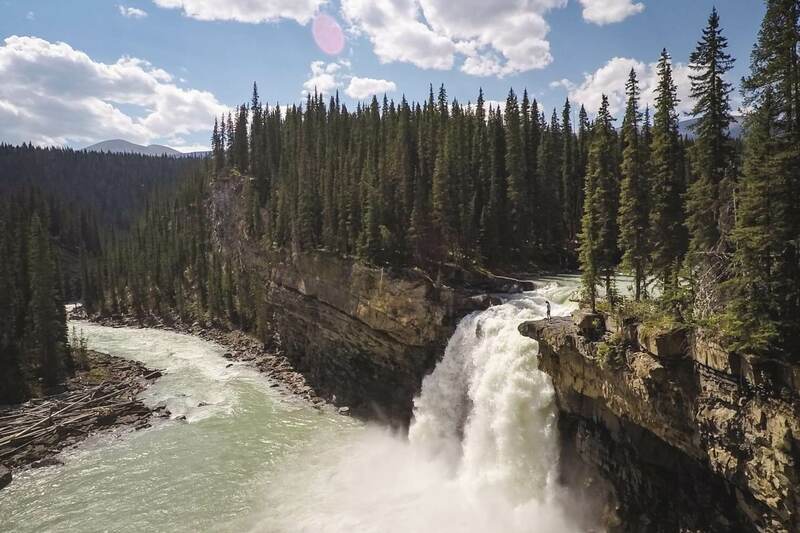 Only 32 km south of Jasper is a gorgeous and very strong waterfall with a mountainous background. The short paved trail with a bridge leads to the lookout point of the falls. You can access it all year round and there is no fee. The area has picnic tables and toilets. A truly off the beaten place in Jasper National Park. The trail leads mostly through the forest with an occasional trail along the river but the reward at the end is spectacular. Hikers do this in a few days and camp at the waterfalls, we’ve biked to the falls and had a great day trip with no people on the trail. 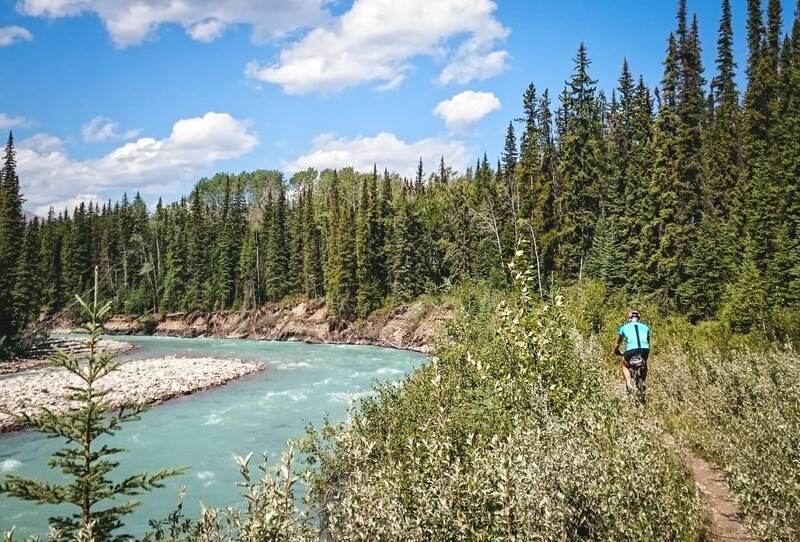 The trail starts about 42 km north of Jasper and the 2nd half is restricted to certain times for inbound and outbound traffic. All the directions to the trail, rules, and tips our in our post about Snake Indian Falls. The longest natural lake in Canada is a popular area for hiking, kayaking, and canoeing. 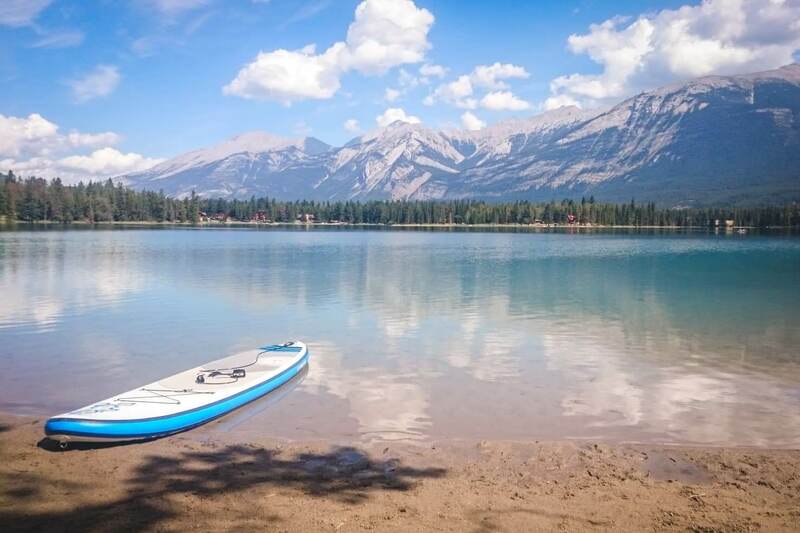 This 23 km long lake can be found 45 km south of Jasper. It’s well-known for its changing colour, depending on the angle sun rays touch the surface. Walk along the shore of the lake and notice the changing colour. You can paddle across the lake, spend the night camping by the shore with a view of the photographer’s favourite picturesque Spirit Island. View of surrounding peaks and three glaciers make it the most popular spot in Jasper National Park. There are plenty of hikes to suit every fitness level including these 3 below. The easy trail to Mona and Lorraine Lakes leads through the forest and starts at the Maligne Lake parking lot. If you are not a fan of crowds, this easy trail is a perfect escape. Although the trail is not very scenic, once you reach the lakes, the beautiful mountain view opens up. It takes around two hours return. After a long day spent hiking, there is nothing better than relax your feet in a chilly lake. When you are sore or very brave, you can always take a quick dip. Another hike starting at the Maligne Lake (but not a flat one). Pass the Maligne Lake Lodge on your left, continue across the Maligne River and park on the left-hand side parking lot. The trail to Bald Hills starts on the fire road behind the gate. You will be hiking a steep trail but the reward of Maligne Lake panorama and surrounding peaks is breathtaking. Top of the hills reaches 2,300 m. A similar hike is just on the other side of the river called Opal Hills. 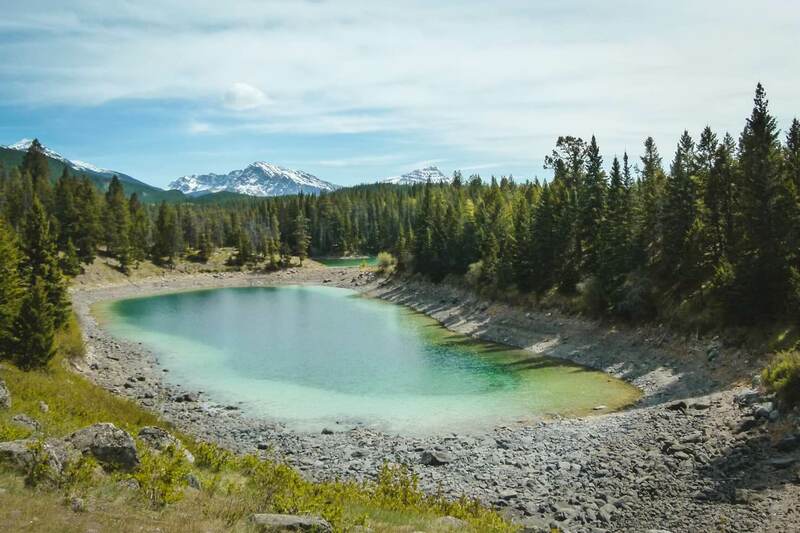 The easiest and shortest hike in Maligne Lake area is an easy loop around Moose Lake. It’s a big and picturesque lake with occasional moose roaming around (hence the name). It’s frequented by many visitors so I would recommend visiting early in the morning to avoid the crowds. 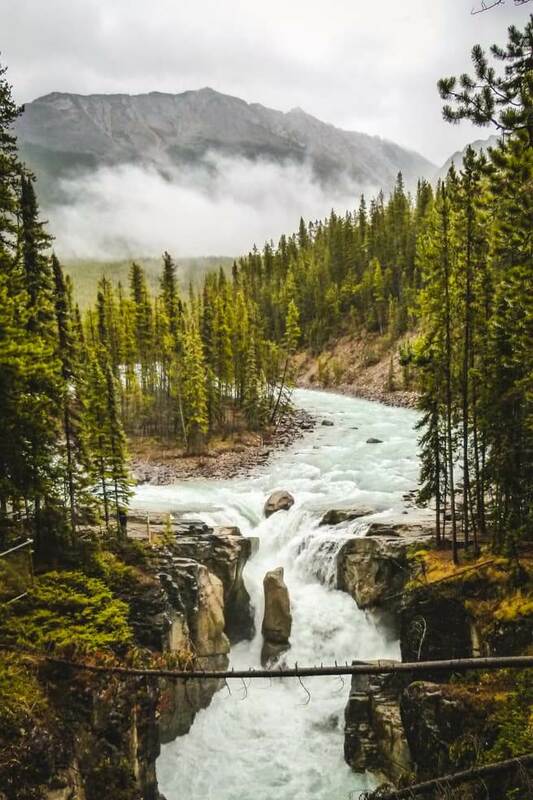 Sunwapta Falls is a very popular and free attraction along the Icefields Parkway. The 18m high waterfall with mountain peaks in the background is located only 55 km south of Jasper. There is a sign along the highway so it’s hard to miss. From the parking lot, you will walk 700 m on the paved trail and across the footbridge for the best view the upper falls. To see the lower falls, follow the trail through the forest for around 1 km and then down the steep section for the better view of the three waterfalls. There is also a restaurant at the mountain lodge and picnic tables in the area. Visit in the late spring when the flow is the strongest due to the melting snow. A relatively little known hike on the Icefields Parkway, 89 km south of Jasper. The trailhead starts at the very small unmarked parking lot on the right side (when driving from Lake Louise to Jasper), 6 km from Stutfield Glacier viewpoint. The easy trail following the creek takes you through the forest until you reach a canyon. It is a beautiful and quiet place with many cascading waterfalls. We haven’t met a single person when we visited during the weekend. The trailhead to Wilcox Pass starts on the Icefields Parkway (127 km from Lake Louise & 107 km south from Jasper). 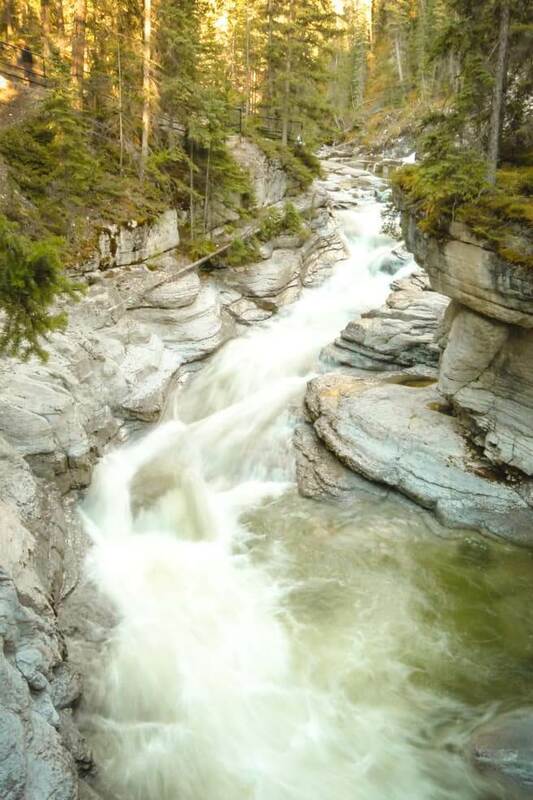 It is located right next to the Wilcox Creek Campground before your reach Columbia Icefield. From the parking lot, you will pass the trailhead kiosk and continue on the wide and well-trodden trail leading uphill through a forest. Shortly, you will leave the forest behind and hike with a view of the Athabasca Glacier on the other side of the Icefields Parkway. 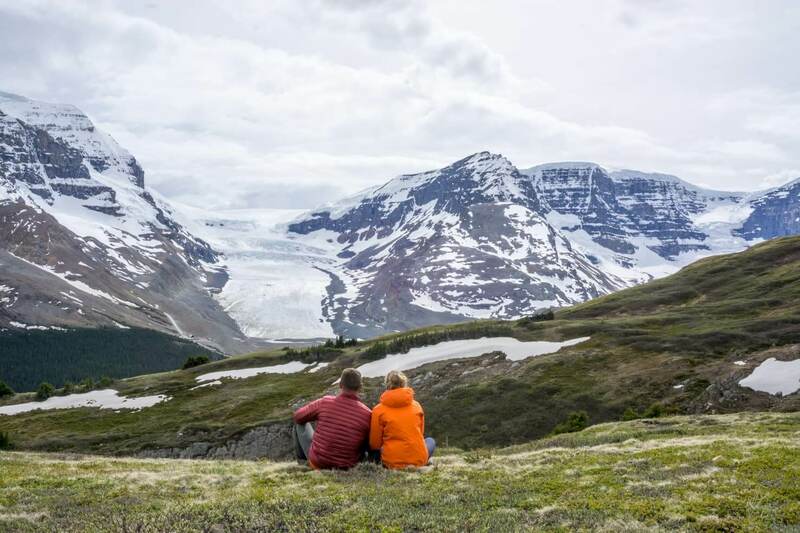 Once you reach the area above the tree line, the typical red chairs are waiting for you to take a break and enjoy the view of the Athabasca Glacier. Continue into the valley where different tundra-like landscape awaits. 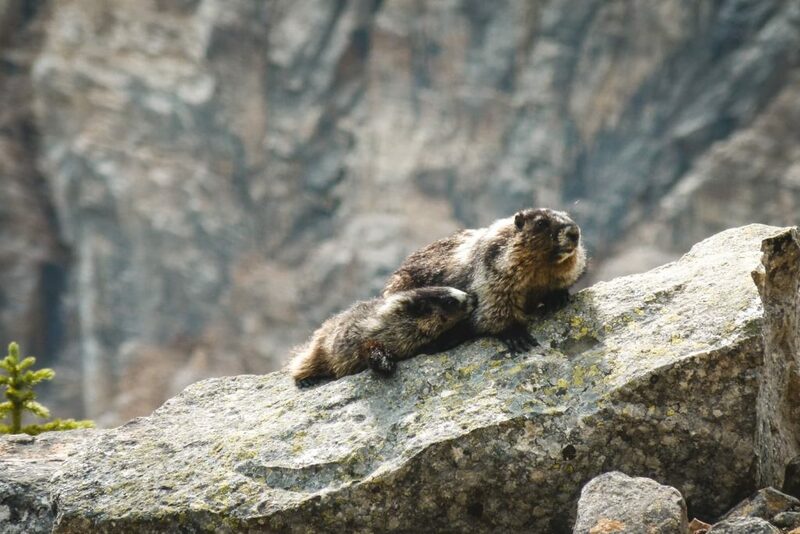 These two are on our list and we can’t wait to hike again in Jasper in 2019 season. The first one is a popular day hike and the other a multi-day trek. We’ll let you know about the hikes very soon. Mountain views of Jasper National Park, ice cold lakes in more shades of blue and green you can imagine and plenty of wildlife were highlights of our trip. 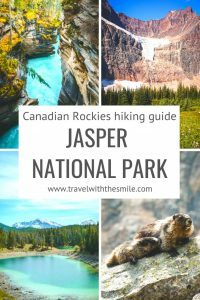 Hiking in Jasper National Park was full of surprises and with the park having so many activities to offer (mountain biking & stand up paddle boarding being our favourites), we’ll be back this season as well. 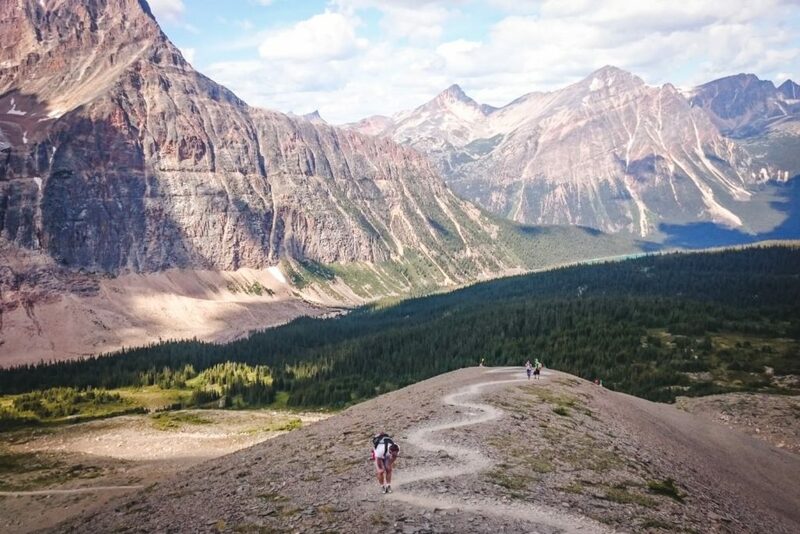 With so many Jasper hikes to choose from, which one is your favourite? 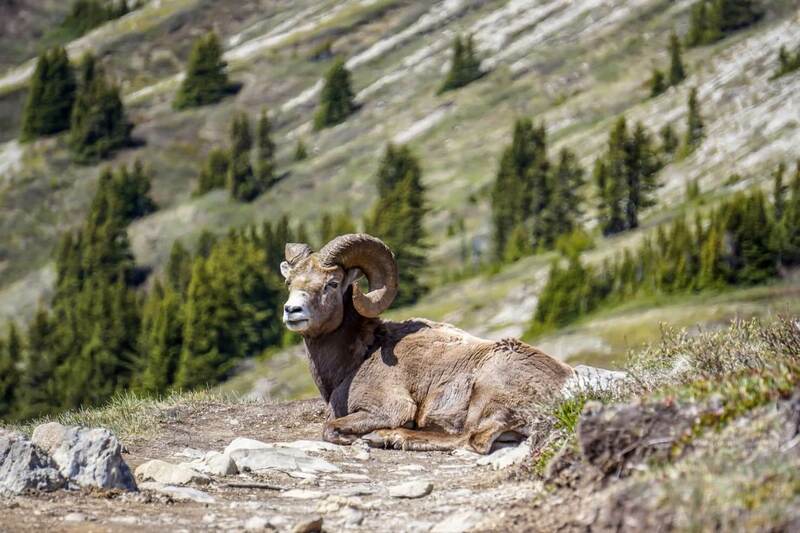 Is hiking in Jasper National Park on your list? 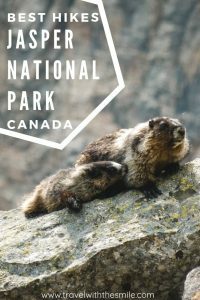 So many beautiful national parks in Canada, it’s really hard to choose which one to visit. We were there last year and only had time to hike Maligne Canyon which was fun. Inspired me to return and do a few more hikes when we return to Canada. Yes, definitely return. There is so much to explore in this park. One of my favourites! Jasper is such an awesome spot! Several of these spots are still on our to do list:) Have you tried Maligne Canyon in winter? Supposed to be pretty spectacular. Yes, I love Jasper! Haven’t visited in winter yet. But I’ve seen too many gorgeous pictures, so might visit this winter and go cross country skiing. When are you heading back? Thank you Stephanie! Jasper really is an awesome place for hiking. What is your favourite place? If there was anywhere else in my beloved Canada that I’d love to hike, other than in my home of Ontario, it would definitely be out west! Beautiful country we live in!